I am tired of all the colored jerseys. I am tired, especially, of the polka-dot one. All this obsessing with going uphill: woman against the grade. Who will win? The mountain. Always. But we insist on pretending that one of our own can take the honors. Strava has taken the Queen of the Mountains concept and inflated it to terrifying proportions. Riders now compete against imaginary selves and imaginary others. Some days I go for a reverse QOM, just out of spite. Can I get my slowest time? How many flowers can I pick? How many pictures can I take? You could argue that I’m just slow and bitter. Fair enough. But there’s a little tickle behind my belly button that I can still feel sometimes when I manage to momentarily forget all of the recording, tracking, comparing and analyzing. Somewhere in that small sensation is the essence of this thing we do, and I want to uncover it again. Is there a joy QOM? Not in the literal sense. Our happiness does not fit into an algorithm, cannot be measured by a computer, and cannot be tracked by a satellite. Our happiness exists outside the Internet no matter how many self-congratulating Instagram photos we may post. You can take a picture of a smile but that doesn’t mean you’ve captured it. What does a picture of a beautiful road tell you about a ride? Very little. Recently I was on a ride with six people and only a few of us knew the route. The leader rolled up next to the rider in front of me as we approached the crest of a climb. “Oh! I should get my camera ready?” She was wearing one around her neck. “No. You should get your eyes ready.” he replied. So we all rolled over the top and spilled down into the sprawling valley in silence. Goldenrod sun drenched the rolling hills, and the clouds in the sky were cumulus masterpieces, the kind that really pop when you crank the clarity levels in the photo app on your phone. But no one reached back to their pockets. No one made a move. We just rolled and looked around, transfixed by the lightness that accompanies the sudden freedom from non-stop documentation. I spent a week this past spring riding bicycles in Italy with six women. We were with inGamba Tours in Lecchi, where I trained for a month in 2012 as I was preparing to ride every stage of the Tour de France route later that summer. Since then I have been in Lecchi so many times it is beginning to feel a little like home, and so I agreed to host the women’s trip for inGamba’s Joao Correia so that I could share the people and the place that played such an important part in making me the rider I am. Most people didn’t think I could finish the Tour de France course. Correia and his staff, for whatever reason, did. And they did everything they could think of to make sure I was prepared. When I think about what we did that year in France—that impossible thing made possible—inGamba is always part of the memory. There was a day during the Tour before the queen stage when we did not have enough support and Correia sent his own soigneur to make sure our team of six had massages on that important rest day. Raul Matias drove eight hours through the night to meet us in Rouen. He’d ridden a 130-mile gran fondo in the pouring rain the day before but he still stood on his feet for six hours rubbing our legs—the legs of our entire team, women he didn’t even know—to make sure we were all ready. For me, inGamba and our success riding the Tour de France will always be inextricably linked. I like to share that level of care with other people. I wanted to share it with women. To create an opportunity for other women to be cared for that way, to relax and breathe and ride hard and eat well and feel strong and connect—to carve out a space for us to ride together without the distraction of men. I thought a lot about what that means, to ride without men. I love riding with men. All the women on the trip also loved riding with men. We can all easily sit in a men’s peloton. Hell, the women who turned up, Jennifer Hannon and Jennifer Buntz specifically, will put most men I know in the hurt locker. But something happens when you take men out of the equation; we stop trying to ride their ride and we start riding our own. We ride hard, we attack, we talk smack, we offer a wheel, we teach and allow ourselves to learn, we grab a pocket to siphon a bit of power from the one who’s hurting us, we regroup or circle back, we stop at a bar for espresso and lie, lizard-like, on the sun-warmed tiled porch. But most of all? Most of all we laugh. We laugh so hard we have to stop pedaling. We laugh so hard we blow accidental snot rockets. We laugh so hard we have to ask the soigneur to massage the muscles in our faces. I arrived at the women’s trip not so fit, but fit enough—overweight and undertrained, a state I like to refer to as really, really fresh. Because I knew the traditional QOMs would be claimed by others, I invented the Eating QOM. Winning the eating title wasn’t as easy as you might think, and it came down to the final lunch. Hannon, who we’d nicknamed “The Hoover”, had pulled away a few nights earlier, mauling a pan of lobster pasta at the restaurant in San Donato. I felt obligated to beat her since she was throttling me good up every single climb, but to claim the prize I had to eat a frightful amount of food in one sitting; tuna salad with fresh mozzarella, prosciutto-wrapped cantaloupe, a plate of bruschetta, a cheese plate, an order of tagliatelle with meat sauce, four glasses of vino rosso. The table agreed that I had enough points to take the lead, but like any great champion, I wanted to win with panache. So, while everyone was sipping the obligatory post-meal espresso, I looked Hannon dead in the eye and ordered a plate of lasagna. Finishing it was easy. I felt nothing; my stomach was a magic, bottomless place. No chain as the cyclists like to say; it was like riding with no chain. No struggle, only dominance. She took a photo of me as I sunk my fork into the soft, cheesy square in front of me. Later, at dinner, I ate two desserts just to underline the point. Who wants to win a sprinter’s jersey without also claiming a stage victory? I wanted to win the entire day. Nail in the coffin. If we’d been awarding points for unmitigated positivity, they would have all gone to Krissy Brunsman. Imagine feeding a bagful of pixie sticks to the Energizer bunny and then trying to keep pace with the resulting giddiness. This woman has an endless smile, bright blue eyes, long medium-blonde hair, and the capacity to find the good in absolutely everything. She would have put Pollyanna to shame. Put her on the bike and the result is epic in a way that Rapha will never understand. Caught up in the glory of suffering and the gritty production of grainy black-and-white badassness, so many of us are quick to forget the most basic underlying feelings that drew us to the bike in the first place: freedom, flight, delight, glee, exhilaration. Brunsman rides with all those things, all the time, no matter what. Her energy is childlike and pure. Keeping up is exhausting, like chasing a toddler around all day, but equally satisfying. I invited her on the trip because I needed that. Because I wanted other people to feel it. Because I knew she’d light me up and I figured I wasn’t the only one. I also knew that combining Krissy with Lecchi would be an explosive proposition. Put the happiest person you know in the happiest place on earth and see what happens. But the real magic was in the group. What makes the perfect ride? A follow van filled with food and spare wheels helps, and picture-postcard vistas don’t hurt either; but when push comes to shove, it’s all about your comrades. Hannon, a 6-foot-tall designer-entrepreneur from Southern California, is months away from launching her women-specific line of cycling apparel, Machines for Freedom. Buntz, the 50-something science teacher from New Mexico, managed, at some point during the week, to ride us all off her wheel. Jamie Hull, a wry-humored, redheaded Silicon Valley tech geek, has a penchant for speaking Spanish after a few glasses of Chianti. And we began to refer to Sarah Mitchell, a PhD-turned-entrepreneur, as “The Enabler” for her talent at getting us to drink much more than was probably prudent but just enough to make every dinner memorable. So far, Lecchi is the only place in the world where I can sleep in past 6 a.m. At night, I shutter the windows of the small apartment in the back of the bed and breakfast and fall into the kind of blissful coma that only that much riding and eating can guarantee. The mornings come with birdsong and church bells from the tower on the hill, the daylight approaching slowly—unhurried in a classically Italian way. What’s the rush? It’s enough to make you want to write a gushing travel story of self-discovery: Eat. Play. Ride. The trip was the final act of my former life—a pivot point, a turn in the road. A few weeks before we all gathered there, I’d accepted a 9-to-5 desk job. Eight years of freelance writing and global wandering were coming to an end. A reversal of the #livingthedream story that we all like to tout. In my world, allowing oneself to get sucked back into the corporate vortex is interpreted as a step in the wrong direction. You gave up. You sold out. These decisions are intensely personal, but we make them (like everything else) in a public arena; one change to a LinkedIn profile triggers an inbox full of curious e-mails, some direct and some thinly veiled as “touching base” or “checking in.” In the case of freelance writers who have done their best to leverage the power of social media, the effect is amplified. If I’d been anything other than 100-percent ready, it might have been a painful revelation. As it was, the transition brought with it a flood of relief, confirmation that my instincts had been right. The job I took was one I’d wanted for a while, one I’d thought about and tracked for nearly a year. It doesn’t involve writing or content creation of any kind and it’s with a company outside of the cycling industry—important details for me personally. In 2012, after finishing the Tour de France course, at a time when I was most defined by cycling, I realized that I didn’t actually want to be defined by cycling. That riding bikes was a hobby and that by leveraging a hobby into a career, I’d somehow undermined its power in my life. I’d gutted it. I’d emptied it. “You’re just burnt out,” my friends told me. “You’ll bounce back.” But I never really did. It took a while to realize that I didn’t actually want to stop riding, I simply wanted to stop feeling like I had to ride. I wanted riding to be fun again. I wanted it to be simple. I wanted it to be quiet. I wanted it to be sacred. So I came back to Chianti with inGamba Tours and checked into B & B Borgolecchi. I let hosts Anna and Morgaro Boschero fill me with pasta and olive oil. I sat in the passenger seat of the van with Giorgio Valvasorri listening to requiems. 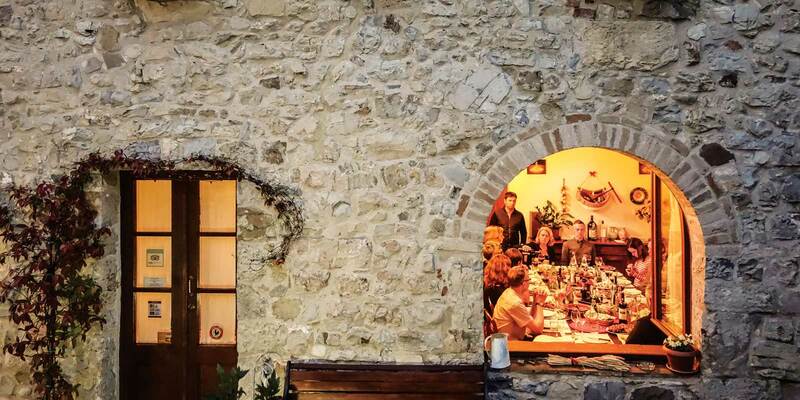 I had lunch with my old friend Lorenza Sebasti, the owner of the Castelli di Ama winery, and we talked about how our lives are changing and which parts of that change make us uncomfortable and which parts we find exciting. Then, on a Sunday, I met a group of women near the top of the hill in Lecchi and let them lead me back to the center of cycling. We had a week together. A week without obligations or kids or conference calls or bills. A week in which they reminded me that the meaning of pedaling is just to pedal. That the beauty of cycling isn’t necessarily in all of the stuff that we think we can learn from it, but just in the act of doing it. The higher meaning is that there is no higher meaning. Just laughter, the purity of good pain, the adrenaline of a fast descent, the perfect bitterness of a mid-ride espresso, a joke shared in a pace line, a story re-told over dinner. It is a connection point, a place for us to be human together. On the bikes we rode hard. We climbed. We climbed a lot. We climbed until we thought we couldn’t climb anymore and then we kept on climbing: 27,000 feet in a week over roughly 250 miles. It’s documented and recorded and uploaded and there is proof—numerical proof. But how many times did we laugh? How many songs did we sing? How many times did we step on Luis’s feet as he tried to teach us to salsa dance? We lost count. Because that Joy QOM is shimmering and invisible—the intangible, unmeasurable thing in the distance that I’ll be riding toward as I pedal off toward my next chapter. Thanks, ladies.